The wonderfully detailed Ayurvedic Man himself. Photo Michael Bowles. Ever heard of Ayurveda? 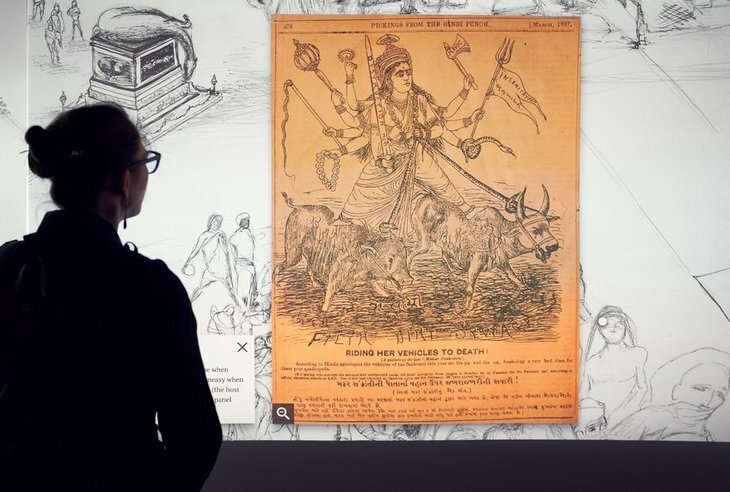 It's a branch of traditional medicine rooted in the Indian sub-continent and there's a free exhibition all about it at Wellcome Collection. It's best to think of it as a mixture of medicine, a balanced diet, meditation and yoga that was being used thousands of years ago before the Western world even knew what these things were. The heart is similar to a lotus, facing downwards. On waking up, it blooms; on sleeping, it closes up. 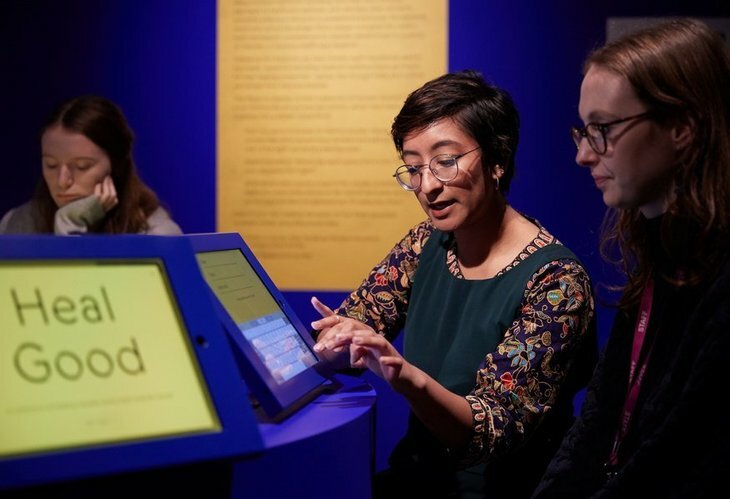 A large part of this exhibition was gathered from Paira Mall, an Indian doctor who set off in the early 20th century to collect items for Henry Wellcome's Historical Medical Museum in London — a collection that would then go on to form part of the Wellcome Collection. A contemporary artwork showing the Bombay plague of 1896. Photo: Michael Bowles. Beautiful anatomical drawings include one showing the traditional Western view of anatomy that we're familiar with, next to a man in a lotus position and his seven chakras — it's a lovely contrast of East and West, and the physical and spiritual worlds. The Ayurvedic Man is an 18th century Nepalese drawing showing the organs and vessels of a man, and it's surprisingly similar to the Western view with recognisable lungs, heart and kidneys; with a few superfluous organs thrown in as well. It demonstrates how Ayurvedic medicine itself evolved after encounters with other schools of thought. Opium was integrated after Islamic traders brought it to the sub-continent, and it was used in treating malaria, cholera and diarrhoea. The female body didn't traditionally feature in Ayurvedic medicine but exchanges with England and its use of midwives was taken on board to change this attitude, at least for certain areas such as childbirth. As the works are all from the museum's own collection, the show is not as complete as we'd like it to be. 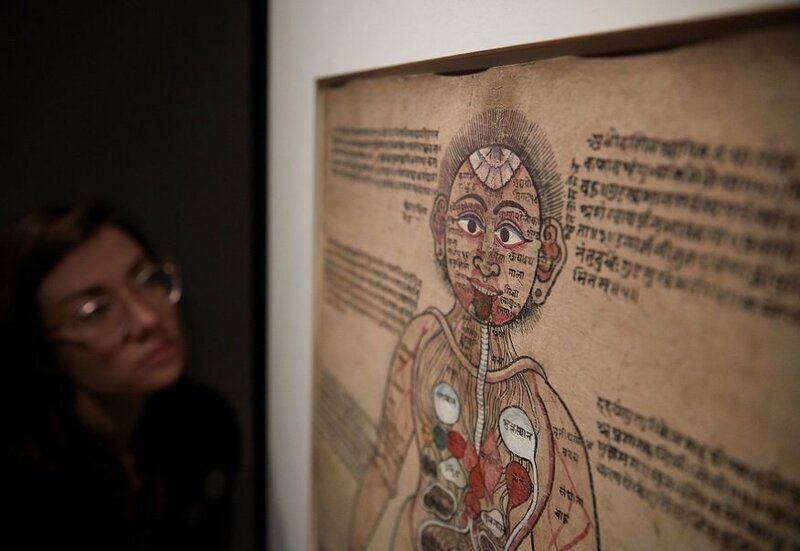 A stunning bloodletting chart with illustrations of dragons, tigers and Gods looks amazing, but the exhibition can offer no guidance on what we're seeing which is disappointing as all the text is in Sanskrit and we're desperate to know more about it. What is here though is impressive with surgical tools shaped on animal claws and beaks, and a look at advanced 18th century plastic surgery where skin was used to replace a nose lost in battle — a process that British doctors would travel to India to learn about. The exhibition takes us right through to the modern age with films about local healers operating today and recipes submitted to the exhibition by people still practising Ayurveda — coriander for aiding digestion, green chilli as an immune booster and ginger for back pain. It would have been helpful to see which of these home recipes has been backed up by scientific research, as we may try some black pepper and honey on toast next time we have a sore throat. 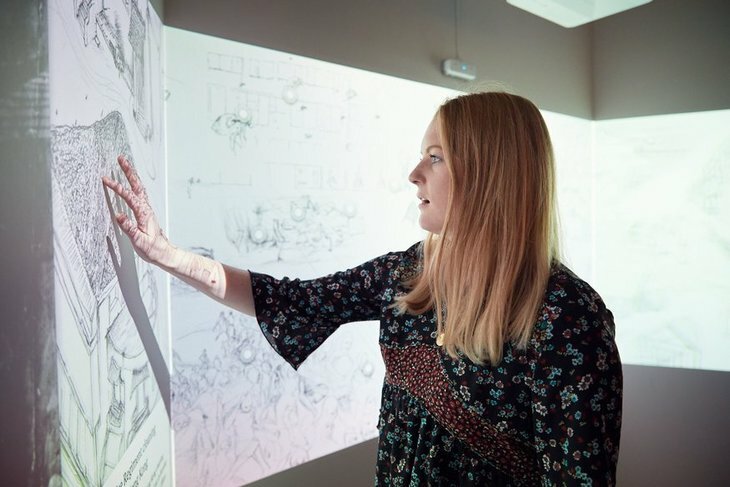 Tablets let visitors look up traditional recipes. Photo: Michael Bowles. Given that wellbeing and watching what we eat has never been a bigger industry than it is today, it's the perfect time to look back millennia to appreciate it's not a recent invention and that Ayurveda was well ahead of us. 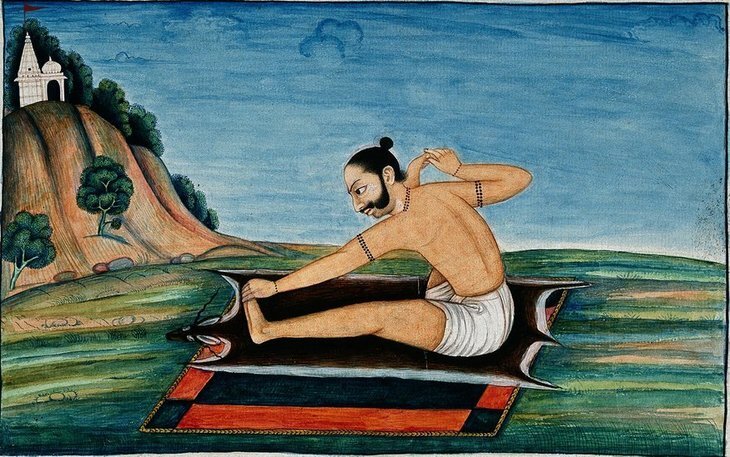 Ayurvedic Man: Encounters with Indian Medicine is on at Wellcome Collection. The exhibition is open Tuesdays-Sundays, admission is free. While at Wellcome Collection also make sure to catch the excellent Can Graphic Design save your life?